This cake is amaaaaaaaazing! No, really, I mean it. It’s actually good, and not just acceptable in a low-carb make-do-with-what-we’ve-got kind of way. What makes it so good, you ask? 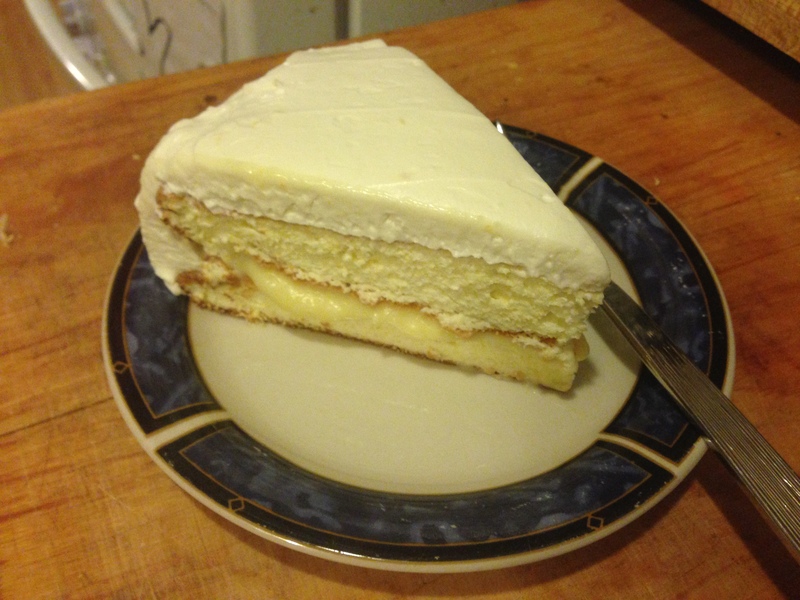 Well, allow me to tell you that it’s incredibly moist, spongy, lemony, tart, creamy, delicious, and has a mouth feel that makes you believe that you’re eating actual cake. And all of this is accomplished without any kind of grain or flour! Being flourless makes this cake suitable for a variety of restrictive diets, in addition to low carb, so I hope people that have given up on cake will discover that they can still have their cake and eat it too. Since the cake, lemon curd filling, and frosting all share ingredients, I made up a shopping list so you can see if you’ve got everything to make all the parts of the cake. Zest your lemons. The zest from 2 good sized lemons should give you more than 2T, which is enough for the entire cake. I used a microplaner, which makes it easy, but a fine grater will also work. Juice your lemons. You need 1/2 C, but if you fall short, making up the rest with bottled lemon juice is fine. Grease 2 10″ pans very well with butter. 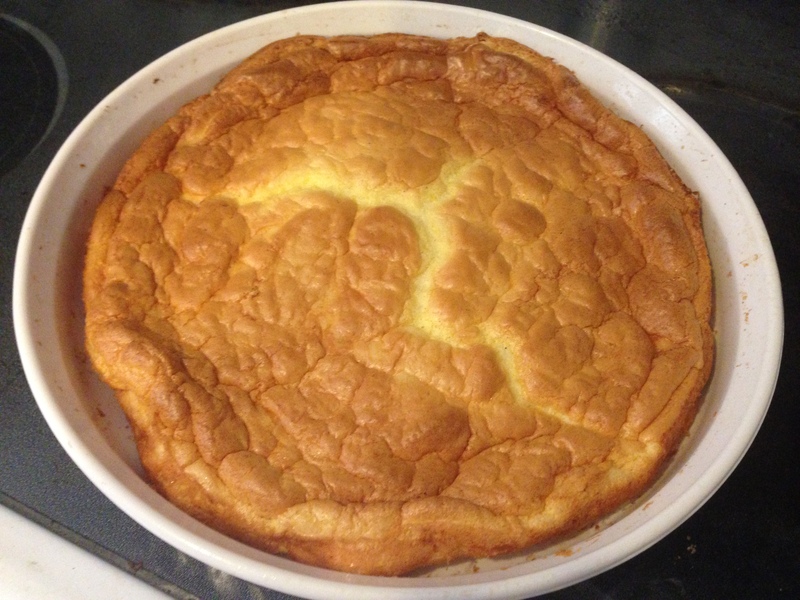 You can use shallow quiche or tart pans, cake pans, or springform pans, as long as you grease the heck of out them. In two large very clean metal bowls, separate the eggs into whites and yolks. Add the cream of tartar to the egg whites. To the yolks, add the softened cream cheese, Splenda, vanilla, lemon zest, and pinch of salt. Using an electric whisk, whisk the egg whites until stiff peaks form. Then whisk the yolk/cream cheese mixture until it is completely smooth. You must do it in this order. Carefully fold in half of the egg whites into the yolk mixture until it’s partly combined, then fold in the rest of the egg whites. You want the batter to be mixed, but you don’t want to deflate the egg whites, so be gentle and stop folding once the batter is reasonably mixed. 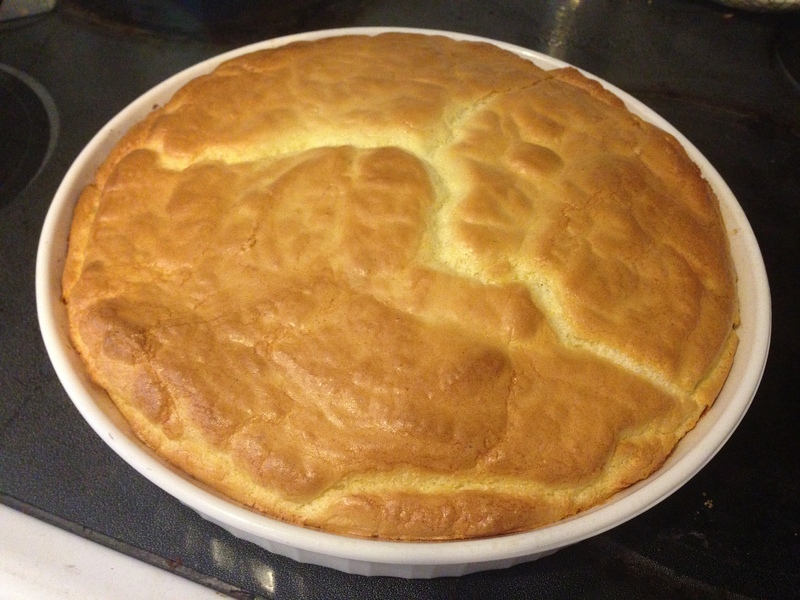 Pour the batter evenly into the two prepared pans, level out the batter, and bake for 30 minutes at 350º. Allow the cakes to cool completely in the pans. The cakes will puff up hugely while baking, but they’ll deflate once they cool, leaving a flat surface with a slightly raised lip around the circumference, leaving just the right sized space for filling. While the cake is cooling, you can prep the ingredients for the lemon curd filling, but wait until the cake is cooled until you start cooking the filling. Cut up your 6 T. butter into small chunks, and put it in the freezer while you’re preparing the rest of the ingredients. In a double boiler, combine the lemon juice, lemon zest, the eggs, the yolk, the sweetener, and pinch of salt. Whisk everything with the electric whisk until it’s combined. Note: For sweetener, I used a mix of Splenda and stevia extract powder, which came out to the equivalent of 1 C. Since 1 C. is a lot of artificial sweetener to use at one time, you may get more palatable results by mixing up types of artificial sweeteners. I cannot recommend using equal measure sugar substitute, as the filler is a carbohydrate. 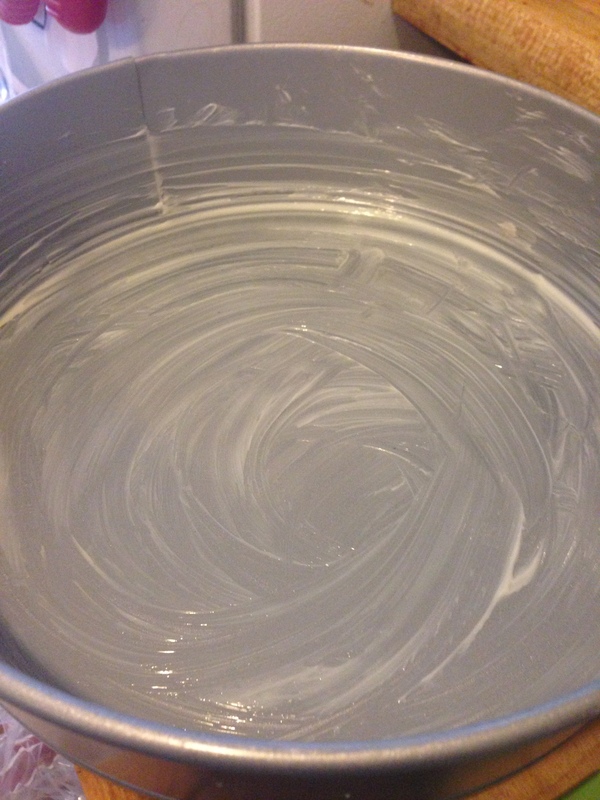 Heat the curd in the double boiler, whisking constantly by hand, until it’s thick enough to coat the back of a spoon. When it’s thick, remove it from the heat and add the butter pieces a few at a time, whisking constantly, until you’ve added all the butter and it’s all combined. Remove one cake from its pan, sliding a butter knife around the edges if needed, and place right-side-up on whatever tray or plate you’ll use to serve your cake. 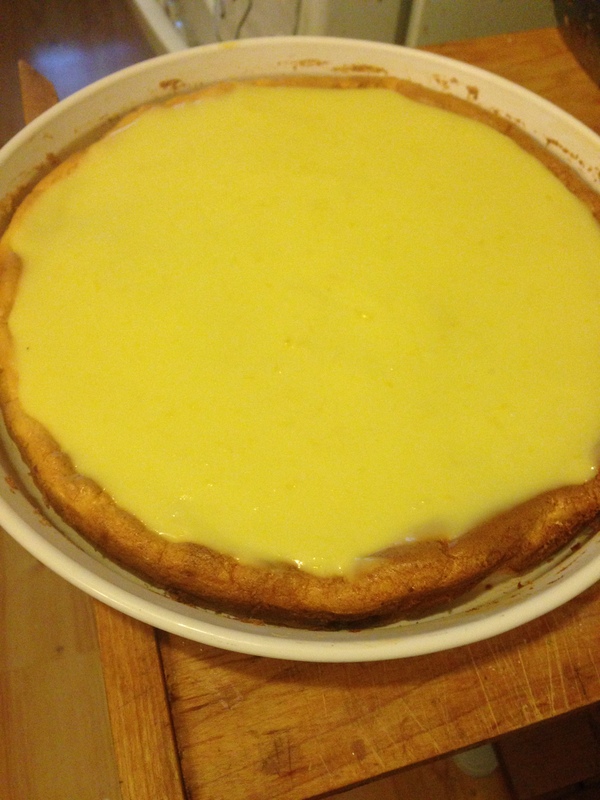 Pour all the lemon curd into the center depression of the cake and spread it out evenly. 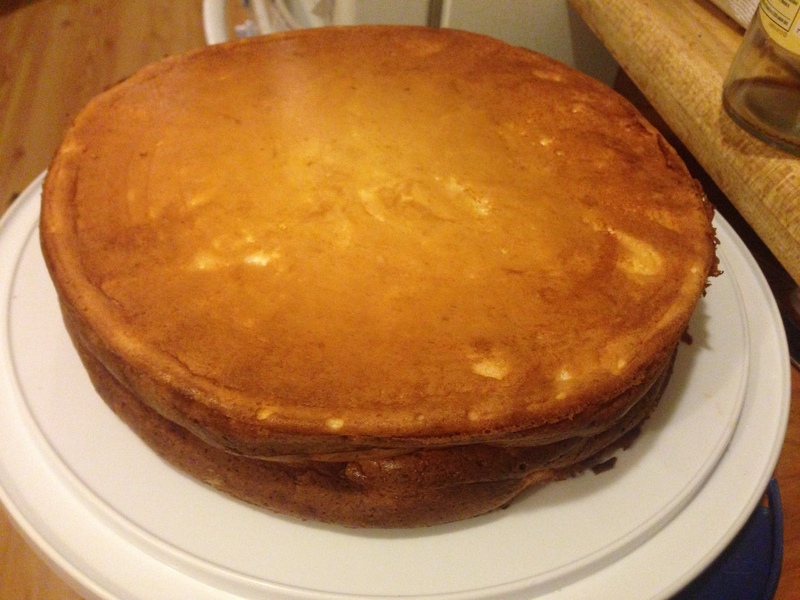 This pic was taken from an earlier (one layer) incarnation of the recipe, so the cake in the pic isn’t removed from the pan. Take yours out of the pan before adding the lemon curd filling. Remove the other cake from it’s pan, and place it upside down on top of the first layer. If it looks like the lemon curd is about to overflow, refrigerate it for about 15 minutes to set it just a bit before topping it with the second layer. Refrigerate the cake until the curd is cooled. The frosting for this is basically a double recipe of cream cheese mousse, with a little extra sweetener and some lemon zest. Put the heavy cream into a large bowl. In a another bowl, combine the softened cream cheese, Splenda, lemon zest, and vanilla. Whip the heavy cream with an electric whisk until firm peaks form, then whip the cream cheese mixture until it’s smooth and creamy. Fold half of the cream cheese mixture into the whipped cream. Cream cheese mousse is more forgiving than the egg whites, so you can use the electric whisk in small bursts to combine the cream and cream cheese. Fold the rest of the cream cheese mixture into the whipped cream, and combine. This will give you a little more frosting than you’ll probably need, but the leftover portion is its own dessert and you can keep it for about a week in the fridge. Use it to top jello and you won’t be sorry. 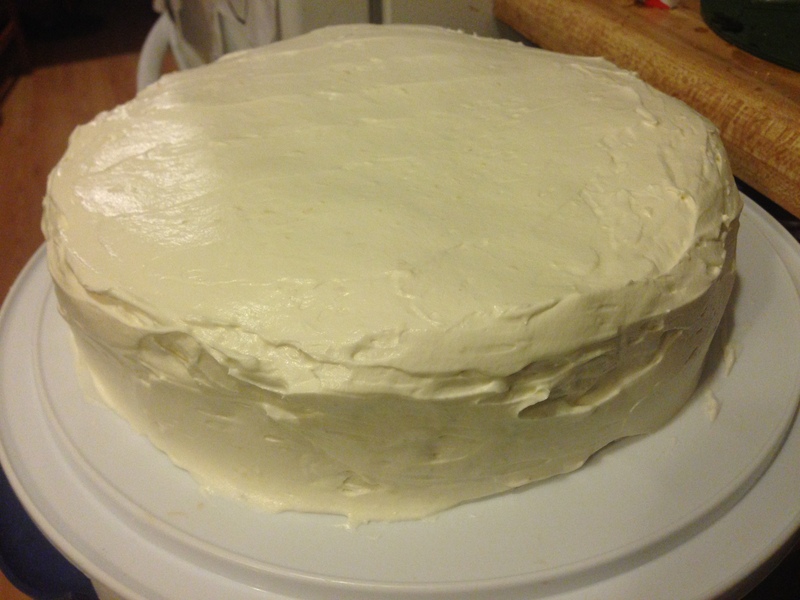 Generously cover the cake with the frosting with a rubber spatula. Refrigerate the frosted cake until the cake is back to refrigerator temperature. You can see my talents don’t include frosting a cake attractively. Enjoy the fruit of your labors. Keep any leftovers in the refrigerator.